The Coma-557 is a turret punch press from Amada and has the desired performance for punching thick and large work at great precision. For superior and stable processing results, the Coma-557 will supply this with the frame structure and the punch press bridge frame. The turret punch press bridge frame will endure a long service life for all tooling. 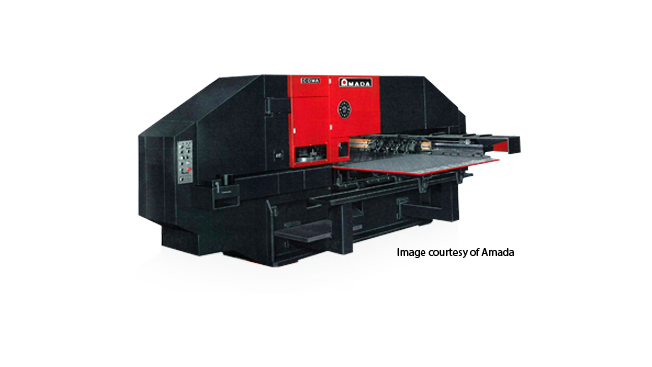 A high rigidity bridge frame is featured on the Amada Coma 557, which eliminates weak points of conventional C-frame punch presses. The 75-Station tooling turret has split-second track selection due to the pneumatic striker system. The Amada Coma 557 works efficiently when combined with SMP/IS software from Merry Mechanization.